Sir (Thomas) William Glasgow, KCB, CMG, DSO (6 June 1876 - 4 July 1955), was an Australian Army Major General in World War I and member of the Australian Senate, representing Queensland as a Nationalist Party member from 1919 - 1931. William Glasgow was born at Tiaro, near Maryborough, Queensland, on 6 June 1876, the fourth child an Irish farmer. He was educated at One Mile State School in Gympie, Queensland, and Maryborough Grammar School. After leaving school he went to work as a junior clerk in the office of a mining company in Gympie. Later he worked as a clerk in the Queensland National Bank in Gympie. Glasgow joined the Wide Bay Regiment, Queensland Mounted Infantry while still a teenager, and with nineteen others he travelled to London in 1897 to represent Queensland at the Diamond Jubilee of Queen Victoria. Glasgow volunteered for service in South Africa and served as a lieutenant in the 1st Queensland Mounted Infantry Contingent. He participated in the relief of Kimberley, the capture of Cronje's laager on the Modder, and the occupation of Bloemfontein. On 16 April 1901 he was mentioned in despatches and awarded the Distinguished Service Order (DSO). After returning to Australia, Glasgow formed a partnership with his younger brother Alexander, and they took over his father's grocery store in Gympie. On 21 April 1904, he married Annie Isabel, the daughter of Jacob Stumm, the Federal member for Lilley. He tired of storekeeping and bought a cattle station in central Queensland. In 1903, Glasgow organised the 13th Light Horse Regiment at Gympie. He was promoted to captain in 1906 and major on 6 May 1912. When war broke out in 1914, he was appointed to the AIF with the rank of major in the 2nd Light Horse Regiment on 19 August 1914. He embarked for Egypt on 24 September 1914 where his regiment trained until called forward for dismounted service at Anzac Cove. Glasgow landed at Anzac on 12 May 1915. When Colonel Harry Chauvel of the 1st Light Horse Brigade reorganised the defences of Monash Valley, Glasgow was appointed second in command at Pope's Hill, under Lieutenant Colonel F Rowell of the 3rd Light Horse Regiment. The idea was the same staff would remain responsible for the post while the 1st, 2nd and 3rd Light Horse Regiments rotated in weekly reliefs. Rowell subsequently became ill and died on 8 August 1915, leaving Glasgow in charge of the post. On 7 August 1915, Glasgow lead an attack on Dead Man's Ridge; the ridge had sweeping views of The Nek. After the failed attack on the Nek, Glasgow, realising that the ridge would now be attacked by the full force of the Turkish army, ordered a retreat. Glasgow covered the retirement, finally making it back carrying one of his wounded troopers. Of the 200 men in the attack, 4 officers and 56 other ranks had been killed and 7 officers and 87 other ranks wounded. Every officer except Glasgow had been hit. The next day he was appointed to command the regiment with the rank of lieutenant colonel. In March 1916 Glasgow was appointed commander of the 13th Infantry Brigade, which he commanded at Mouquet Farm in September 1916, Messines in June 1917, Polygon Wood in September and Dernancourt in April 1918, where the brigade helped stop the German advance. Following the German attack which captured Villers Bretonneux in April 1918, Glasgow was ordered to form the right wing of a counterattack to recapture the village. Glasgow did not agree with the 8pm start time of the attack, he wanted to attack under moonlight at 10.30pm. Eventually a time of 10pm was agreed on. At the height of the battle, with the 13th Brigade surrounded on three sides, the Germans had sent Glasgow a message demanding that he surrender. "Tell them to go to Hell" was his response. On 30 June 1918, Glasgow was appointed to command the 1st Division, which was fighting alongside the British in Flanders. On 8 August 1918, the 1st Division joined the other four divisions on the Somme front, participating in the Battle of Amiens (8 August 1918), Lihons, Chuignes and the Battle of the Hindenburg Line. At the Second Battle of Villers-Bretonneux, Glasgow's 13th Brigade, and Harold Elliott's 15th Brigade, recaptured the town of Villers-Bretonneux on 25 April 1918 after the Germans had overrun the 8th British Division under General William Heneker. This feat was described by Lieutenant-General Sir John Monash as the turning-point of the war. For his services during the war, Glasgow was made a Companion of the Order of St Michael and St George (CMG) in June 1916, a Companion of the Order of the Bath (CB) in December 1917, and was appointed Knight Commander of the Order of the Bath (KCB) in the 1919 New Years Honours List. He was Mentioned in Despatches nine times. 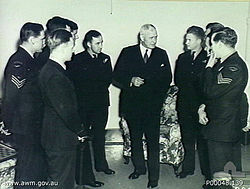 Picture - Major General Sir William Glasgow, Australia's High Commissioner to Canada, speaks with aircrew of the British Commonwealth Air Training Scheme in the Anzac club. After the war, Glasgow commanded the 4th Division from 1921. He led the Anzac Day parade in Brisbane for twenty years. Glasgow was elected to the Senate as a Nationalist in 1919. He became Minister for Home and Territories on 28 June 1926, and then from April 1927 to October 1929 was Minister for Defence. Out of office in 1929, he became deputy leader of the Opposition in the Senate. Glasgow saw his role as frustrating Labor's inflationary policies. Unfortunately, such policies were exactly what was required, and so Glasgow inflicted much suffering. In 1931 Labor polled well enough in Queensland against the national trend that Glasgow lost his seat. His political career over, Glasgow resumed his pastoral interests and became director of several companies. On 24 December 1939, Glasgow was appointed first Australian High Commissioner to Canada. Canada thus became only the fifth country in which Australia had diplomatic representatives. Glasgow built good relations with the Canadian Prime Minister Mackenzie King and his ministers, but was not successful in getting Canadian support for Australian strategy in the Pacific. He did conclude a "mutual aid" agreement between the two countries, resulting in Canada providing two merchant ships to Australia. 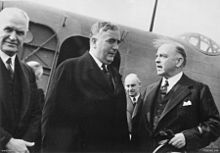 In August 1943 and September 1944 Glasgow attended the Quebec Conferences between US President Roosevelt, British Prime Minister Churchill and Canadian Prime Minister Mackenzie King, where he represented Australian interests. Glasgow returned to Australia in 1945 and once again resumed his pastoral and business interests. He died in Brisbane on 4 July 1955. He was given a state funeral and cremated. In 1966, a bronze statue of Glasgow was erected in Brisbane. During 2008, a statue was erected at Post Office Square (opposite ANZAC Square), also in Brisbane.